The outfits will be unveiled Thursday, and the young quarterback is "really excited" to get the reaction of Jets fans. Sam Darnold has only seen video of Le’Veon Bell, but he’s already imagined what it will be like to have him in the backfield since the Jets signed the two-time All-Pro to a four-year, $52.5 million contract last month. 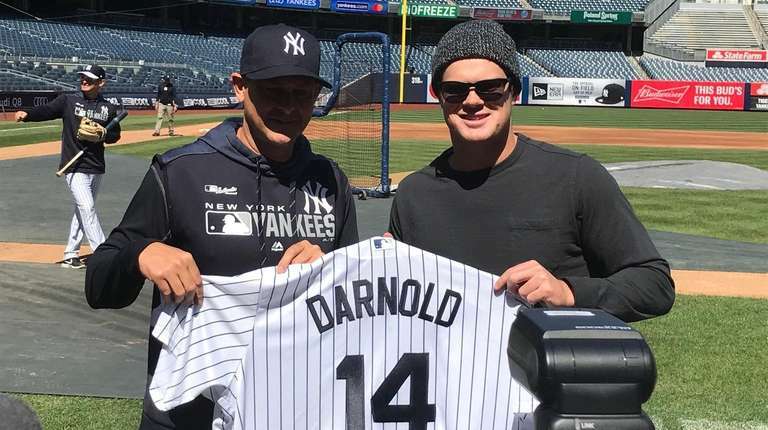 “I love it,” Darnold said Wednesday at Yankee Stadium. “I mean, what’s not to love about it? Le’Veon is a great player. He’s very instinctual, too. He’s very quarterback friendly, which I’ve noticed watching his tape a little bit. Whenever Big Ben [Roethlisberger] was back there ... as a quarterback, you sense when time runs out. You start looking for guys and Le’Veon is always really friendly and he’s always right there in your vision. Or he was always in Ben’s vision. The day before he’s scheduled to model the Jets’ new uniforms, Darnold showed up at the Stadium and held up a different jersey, this one a pinstriped No. 14 with his name stitched across the top. Otherwise, Darnold wore a knit cap and shades, offering no hint of Thursday’s grand unveiling, other than a thumbs up to the design. Darnold spent time talking with manager Aaron Boone, another USC alum, in front of the Yankees’ dugout and planned to stay for the game. He joked about waiting for the nice weather — “And I’m still wearing a beanie,” the SoCal native said — to take in his first experience with seeing baseball in the Bronx. “It’s a great environment,” said Darnold, who was interested in seeing the difference from his own game days at MetLife. Darnold said his baseball career ended after freshman year in high school when he dropped the sport to concentrate on his other two favorites. Jets QB Sam Darnold to host football camp on LISam Darnold is bringing his talents to Long Island for one day this June. The ... NFL mock draft 5.0See where Kyler Murray, Nick Bosa, Dwayne Haskins and other top prospects could end up.